An optimized Supply Side Platform acts provides a fast and efficient experience to publishers in monetizing their digital inventory. Now publishers can easily pitch their offers to a great number of advertisers. dJAX SSP adheres to the OpenRTB standards and introduces the Cost per impression (CPM). This has given a whole new outlook to the way to buying and selling digital inventory. RTB auctions are faster, more efficient and comparatively cost effective on both sides of programmatic. From App developers to website and blog owners could be a part of the RTB ecosystem. dJAX SSP enables publishers monetize their digital inventory. They can also choose the ad format and size that are suitable for their viewers, manage their revenue by defining bid floors and send out ad inventory offers to a number of demand sources. QPS control: Admin and the individual DSPs can control requested QPS for each DSP. Performance: Cache & data compression for high performance in the bidding process. 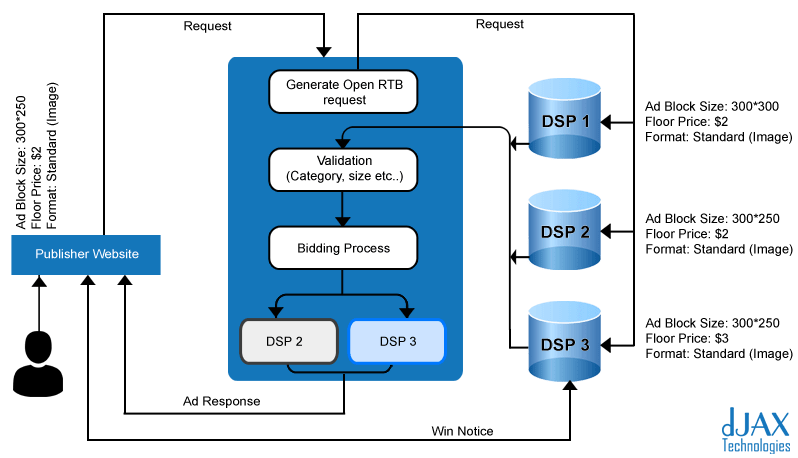 Open RTB: dJAX SSP follows an IAB standard OpenRTB digital advertising protocol. Invoice system: Most efficient invoice management system for publishers and DSP’s. Reporting: Admin, DSPs and publishers having various breakdowns reports. Payments: PayPal, wire transfer and other payment methods can be added. dJAX Supply-Side Platform(SSP) caters 3 separate panels to manage the platform features. Admin panel: Administrator has complete control on all connected DSPs and Publishers. Admin can set the QPS for individual DSPs, payments, and reports. DSP panel: Configure server ping URL, Ad-type, payment info and QPS control to get the request from SSP based on the need. Publisher panel: Publisher can setup and control their website, Adblocks/ zones, floor price, all payment information and reports.